We are delighted to welcome University College Cork’s UCC98.3Fm Campus Radio Station to TAPSTAK! 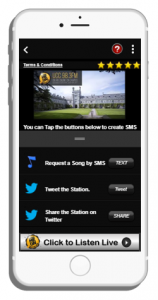 Request a Song by SMS, tweet the station or listen to UCCFM online at the tap of a button with the UCC98.3Fm micro-app! UCC 98.3FM is Ireland’s only 24/7 student radio station, featuring music, news & current affairs, and award-winning documentaries. Broadcasting a 60% talk–40% music schedule each week, UCC98.3Fm has received a number of awards and nominations for its work over the years. Request a Song by SMS. Tweet your opinion to the Station.